Happy Mother's Day to all of you sweet moms who are with us one our parenting journey! I never stop feeling blessed when I think of you! And to all of the women who have lost babies, or who are still waiting for children of your own, my heart goes out to you. If you've been following our blog since the beginning, you'll know that we struggled to have children too. Much love to you today and prayers for peace. You aren't ever forgotten! 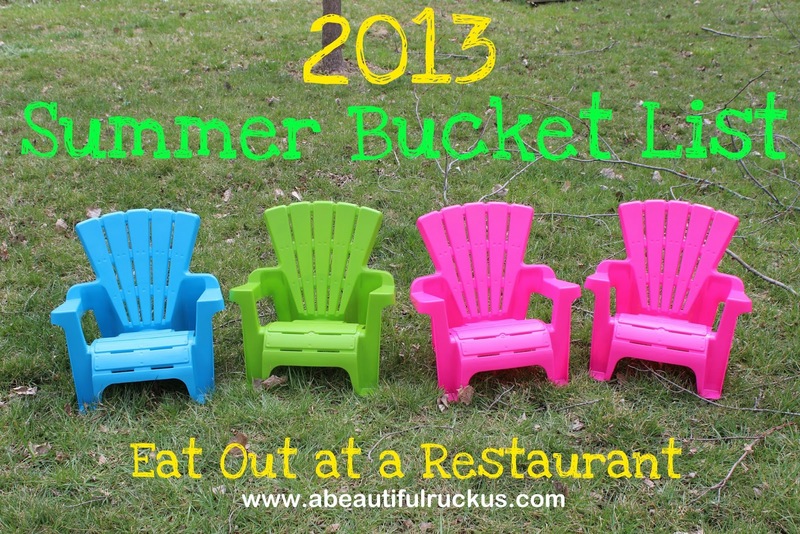 We've checked off another item on our 2013 Summer Bucket List! 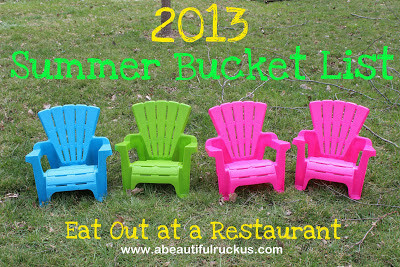 If you want to see other bucket list posts about our adventures this summer, click HERE. Last summer, we took the kids to a buffet and a fast food place, but we hadn't taken them to an actual sit-down restaurant yet. Oh. My. Word. Does taking four 2-year-olds to a restaurant sound terrifying to anyone else?? Group shot! In addition to Pa and Ma, Tuma and Papa (the kids' great-grandparents), Uncle Todd, Aunt Ruby, and Cousins Marissa and Toby were there! But my mother-in-law wanted to go out for Mother's Day, so we packed the kids up and took them to a delicious local place that makes some amazing homemade fried chicken with all of the fixings. RC's Restaurant is so, so good! In preparation, we took our usual two diaper bags plus a tote full of things to keep them busy: coloring books, crayons, books, magnetic doodle pads, and puzzles. Caleb and Elijah right after we sat down. Surprising, they did a really good job! Baskets of crackers kept them occupied for awhile, and when that failed, we brought out the coloring books. Yay! I didn't even need to get out the puzzles or books. First chicken fingers and they loved them! Toward the end, they got really restless, and I could tell that our hourglass was running out of sand. We beat a hasty retreat back to the car and succeeded in escaping without any meltdowns. Yay! Hey, but the goal is to get through the whole Summer Bucket List, so I'm really happy that we can already mark this one off, and it's still May! Check that one OFF!!! Good for YOU! I'm going back to see the rest of your bucket list! I'm so excited to get such an early jump on our bucket list this year! Me too! Their chicken is amazing! I think it's one of those things that you just have to do. Good luck, Mama!